Due to the many requests by BlogrCart Blogger store template fans, the send order email form now displays as minimal as it gets at the receiving email! No more forms to build! Setting up an e-commerce featured website on Blogspot is always made easy with BlogrCart shopping cart themes. View live working demo here at http://blogrcart-white2.blogspot.com & take the 2 minute theme tour - for free! In screenshot above shows how minimal the send order form can display. Removing all unnecessary (or empty) fields so it is more cleaner. The top and bottom section will display your store name & any unfilled data not sent from BlogerCart template settings will also not render. This plug-in is still free to use with unlimited usages for BlogrCart blogger shop/store themes & can be accessed 24/7 from anywhere around the world. Grab mmore BlogrCart Blogspot theme here at our template gallery page & file repository. 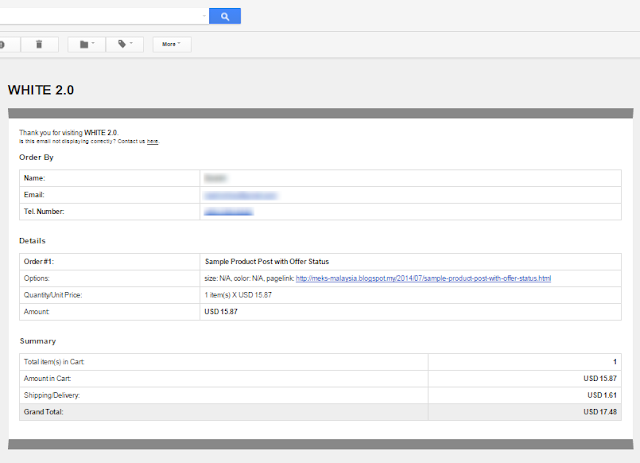 Now the sent email comes in minimal style to suit any BlogrCart website it comes from (your send order form). Subtle light grey-ish background with a touch of charchoal top & bottom borders really stands out & display the necessary information coming from your store theme & send order form. To allow a minimalist styled display of sent emails, empty input from your send order form at your BlogrCart store will not be displayed/render at the email body. This feature was used at the Message Comments input box earlier (when this field is not filled at form, it does not display at email), now this feature can be used for other selected form fields. The detail customization will be available soon. Find out how easy to use this feature from your existing BlogrCart theme without compromising your current set-ups. In order to display the necessary information for Email Order Summary Section, all empty/or zero (0) value for shipping & tax rates coming from your BlogrCart store will not show up/render at e-mail body. If an item/product selected from your store does not have a product selection ie. size, colour etc, the product select option table row will not display/render at email body. in previous notification display, this section is left empty. Now at email notification footer, your store name, address, contact number & email address is only displayed. And, if any of the data is not set at your theme cart-email-settings , then the relevant area will be left empty to allow. again, a minimalist style display. In previous sent email set-up, the form is using the international currency codes (form your store) to display as the price currency symbol with trailing 2 digits accuracy as the final prices. Now Blogrcart store owners can customize the way the final prices is rendered at the email body. Customization includes delimiters, decimals & the prices accuracy. Find out on the add-on functions that can be easily installed at a BlogrCart template right here at our blog. Stay tune for the details add-ons required. Copy & paste and all is set! This update is essential in providing the best (and fastest) sending mail datas to the receiving end. It also prevents emails sent to be flagged as spam, especially by free e-mail providers. The send order e-mail plug-in now filters out only important data coming from your BlogrCart template settings & form to "push" to the receiving end. But then again, it is up to your send order form settings, especially when adding your custom text by using common "spammy words" for example "Sale", "Free", "Best Buy", "Free Download", "Buy Now", repetitive wordings or words related, which might get your email be flagged as spam. Follow the general guidelines by the respective email providers. This send order email notification will not be your final invoice when users shop at your BlogrCart powered e-commerce Blogspot store. This plug-in is only as a notification for you as store owner & a copy sent to the users in accordance to on-line form submission best practices. The final invoice comes from you as store owner. You can easily create an awesome invoice like theme (or template) using your preferred e-mail provider add-on functionalities. This way, you can show your brand more effectively & follow up on the orders sent professionally.